Raleigh Bryce Henshaw4,5 [Releigh Bryce Henshaw6,7, Bryce Henshaw8, Jack Henshaw4,9]. Wilma Louise Henshaw, 81, of South Beach, died Dec. 15, 2006, in Newport. She was born June 20, 1925, in Reeds, Mo., to Anna and Arthur Stroup. 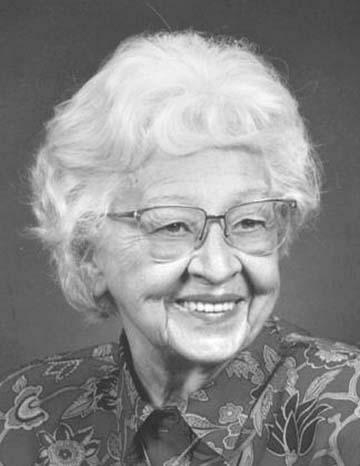 She settled in the Albany area in 1941. She was director of the Simpson Employees Credit Union, and served as treasurer for the Albany First Assembly of God for many years. She was preceded in death by her husband, James Olaf Randolph, on Aug. 4, 1969. She settled in South Beach in 1983. Her second husband, Raleigh Bryce "Jack" Henshaw, preceded her in death on Aug. 28, 1991. She enjoyed quilting and spending time with her family. Survivors include three sons, Bill Randolph of Kirkland, Wash., Roger Randolph of Salem, and Gary Randolph of El Paso, Texas; a daughter, Beverly (Randolph) Hill of Lebanon; a sister, Doris Speer of Springfield, Mo. ; a brother, William Phipps of St. Louis, Mo. ; three stepdaughters, Sandy of Scio, Kathy of Lebanon, and Mickie of Camas, Wash.; a stepson, Raleigh Henshaw of Lebanon; 19 grandchildren; and 19 great-grandchildren. Viewing will take place from 10 a.m. to 11 a.m. followed by a funeral service at 11 a.m. today (Wednesday) at AAsum-Dufour Funeral Home, 805 Ellsworth St. SW, Albany. Interment will follow at Willamette Memorial Park. The family suggests memorial contributions to Samaritan's Purse International Christian Relief, PO Box 3000, Boone, N.C. 28607; or Northwest University, 5520 108th Ave. NE, Kirkland, Wash. 98033. Wilma Louise (Randolph) Henshaw, 81, of South Beach died Friday in Newport. Wilma was born in Reeds, Mo., the daughter of Arthur and Anna Stroup. She moved to the Albany area in 1941, living there until moving to South Beach Oregon in 1983. Wilma was married to James Olaf Randolph, who preceded her in death on Aug. 4, 1969. 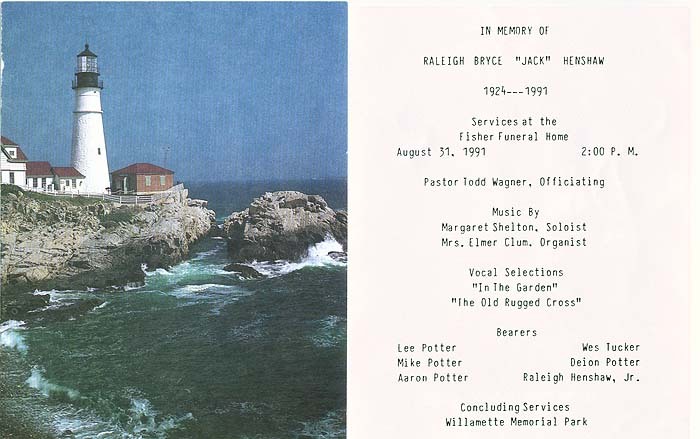 She later married Raleigh Bryce "Jack" Henshaw, who preceded her in death Aug. 28, 1991. Wilma served many years as treasurer of Albany First Assembly of God and as director of the Simpson Employees Credit Union. Her love for people made her successful in both. Wilma loved her Lord, her church, her family and making beautiful quilts. She is survived by sister Doris Speer of Springfield, Mo. ; brother William Phipps of St. Louis, Mo. ; sons Bill of Kirkland, Wash., Roger of Salem and Gary of El Paso, Texas; daughter Beverly Hill of Lebanon; Jack’s children, Sandy of Scio, Kathy of Lebanon, Mickie of Camas, Wash., and Raleigh of Lebanon; 19 grandchildren; 19 great-grandchildren. Viewing will be from 1 to 7 p.m. Tuesday and 10 a.m. to 11 a.m. Wednesday at AAsum-Dufour Funeral Home. The funeral service will be at 11 a.m. Wednesday. Burial will follow at Willamette Cemetery. In lieu of flowers, contributions can be made to Samaritan’s Purse International Christian Relief or Northwest University in Kirkland in care of AAsum-Dufour Funeral Home (www.aasum-dufour.com). Obituary of Wilma Louise Henshaw. Obituary of Sandra J. Henshaw. Obituary of Doris Katherine Cormier. 1930 census, Tangent Precinct, Linn County, Oregon; roll T626-1947, ED 60, page 5A, line #33, dwelling #81, family #81.